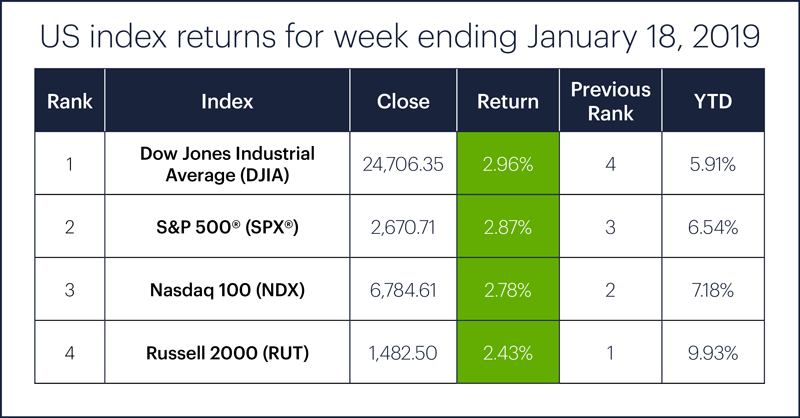 Heading into the back end of January, the US stock market is enjoying one of its best starts to a year…ever? Yeah, pretty much. More on that later. A positive start to earnings season—spearheaded by bank stocks—got a boost from renewed optimism about a trade-war resolution. The result: The fourth-straight up week for the S&P 500 (SPX), which has now erased more than half of its October-December correction. 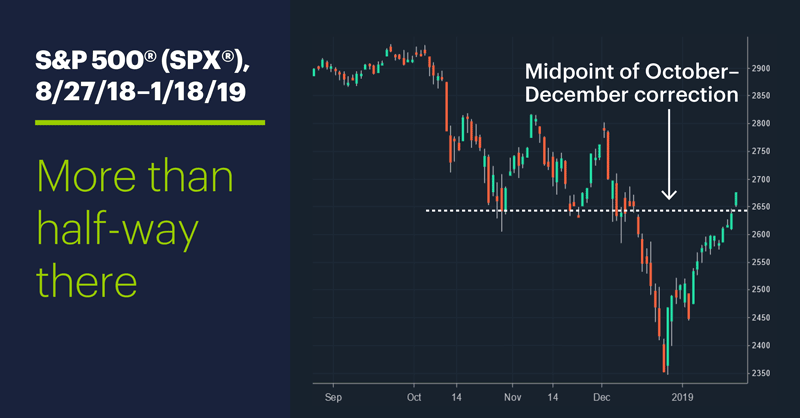 Along the way, the market shrugged off Brexit drama, the ongoing government shutdown, and some poor housing market data. As the week was winding down, rumors, and then reports, of progress in the US-China trade impasse—specifically, a Chinese proposal to increase its imports of US goods over the next six years1—pumped up the market late Thursday and Friday. Sector action: The top-performing S&P 500 sectors were financials (+5.9%, moving from worst to first), industrials (+3.1%), and energy (+2.6%). The worst-performing sectors were utilities (-0.4%), consumer staples (+1.4%), and communication services (+1.6%). Highlight reel: California utility provider PG&E Corp. (PCG) continued to implode, dropping more than 50% on Monday. On Thursday, Signet Jewelers (SIG) took a -25% hit after reporting weak holiday sales and downgrading its 2019 outlook. Netflix (NFLX) dropped around 5% in Thursday’s post-market session after releasing its quarterly numbers (beat on earnings and subscriber growth, missed on revenues1), and despite attempting to rally intraday on Friday, closed down -4%. Futures watch: February WTI crude oil (CLG9) broke out of its trading range on Friday with a nearly 3%-plus gain that took prices close to $54/barrel. February gold (GCG9) broke out of the narrowest portion of its consolidation on Friday—in the opposite direction of crude—dropping to its January 4–9 lows around $1,280/ounce. While it may seem like the Brexit saga is destined to last longer than the Dr. Who franchise, one chapter closed last week: the UK Parliament’s vote on Prime Minister Theresa May’s Brexit plan (got crushed on Tuesday) and the no-confidence vote in May’s government (she squeaked by on Wednesday). Although some market watchers had expected the British currency to suffer in the aftermath of the parliamentary vote, March British pound (6BH9) futures responded with an intraday rebound on Tuesday and rallied above 1.3000 by Thursday—their highest level since November 15—before falling 1% on Friday. Making the grade. If the first 13 trading days of the year were a test, 2019 would be getting an “A”—even if graded on a curve. The SPX’s year-to-date return as of Friday was 6.54%, bigger than the 13-day return in all but three years since 1950—that places it at the 97th percentile, and marks the third-straight day it’s been above the 90th percentile. Not bad for the year’s first pop quiz. That’s doesn’t mean another correction is imminent, but experienced traders know markets don’t move straight up indefinitely. 1 Bloomberg.com: China Offers Path to Eliminate U.S. Trade Imbalance, Sources Say. 1/18/19. 2 CNBC.com. Here's what every major analyst had to say about Netflix's mixed earnings report. 1/18/19.